Robin Hood! 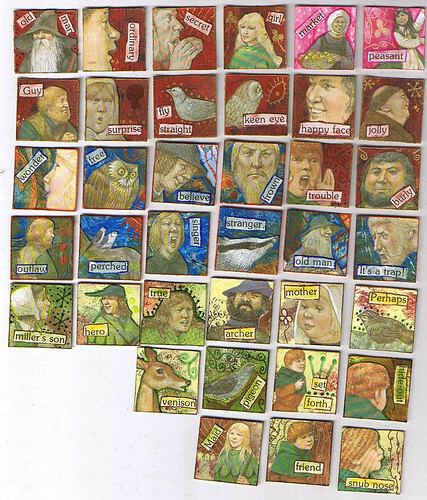 As promised, I've been working on a set of 1x1s using a kids' book version of Robin Hood. There were tons of images in this book and with the text was a bit smaller than in the previous book I had an easier time finding suitable text, though I still did mainly stick with single words. These are so much fun and looking somewhat different than my usual work. I really like this set! I especially enjoyed using the bird and animal images. Click to see bigger. And select "All Sizes"
I spent some time the other day painting some more backgrounds and slicing them up into 1-inch bases as my little basket was starting to empty. Next up is Pinocchio! This one is going to be fun, the illustrations are a bit on the 'creepy' side actually. Pinocchio is definately a bit scary-looking and there are some other mean-looking characters. OoOohhh, creepy Pinnochio, can't wait to see those!